J. Walter Landscape & Irrigation, a Portland-based landscape contractor and construction company, will help you create the garden design of your dreams specializing in soil preparation, irrigation and sprinkler systems, hardscapes, drainage and night lighting. Jaylene is always on-site with her crew making sure you receive the quality work you expect and deserve. We are a sustainable landscape company that cares about beauty, ecology and joy. 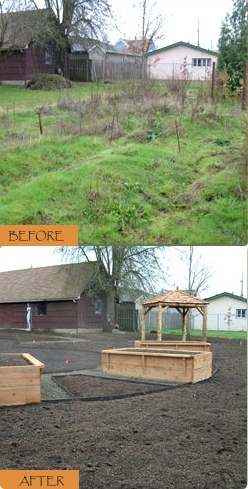 J. Walter, a landscape construction company, works with a variety of experienced designers in Portland. Together we connect and integrate your individual needs to your unique vision creating your perfect garden. You can decide whether to implement the plans for your garden at one time or in phases, depending on your needs. Garden coaching is also available. Part of proper irrigation is good design. We install drip irrigation as well as sprinkler systems creating irrigation specific to your garden needs. J. Walter is a licensed irrigation/backflow company. Good soil preparation is the foundation for a healthy and vibrant garden. We hand til organic amendments enriching soil biota which lowers costs from maintenance, pesticide use and water while at the same time preventing disease. The majority of the time we use a steel flat bar edging. Often times there are also re-used materials found on site like stones also used for edging. We prepare each plant individually for planting by using beneficial mychorrizea encouraging healthy roots ensuring quick growth and longevity for your entire garden. We install traditional low voltage lighting as well as high efficiency LED lighting for evening ambiance in your garden.